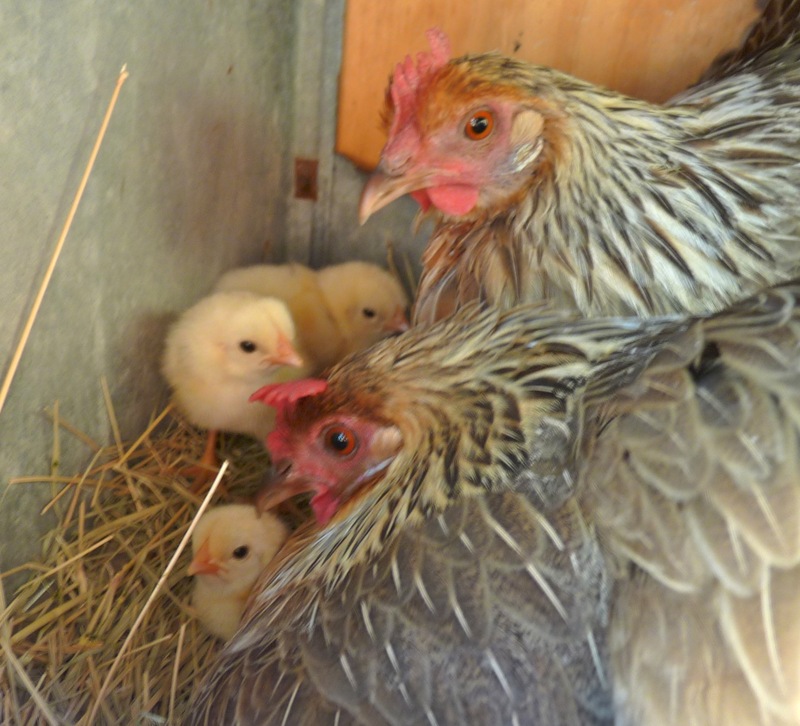 Our two Golden Phoenix hens - oh, let's call them Cagney & Lacey - both went broody within a week of each other, and by combined effort hatched three fuzzy peepers about three weeks ago. 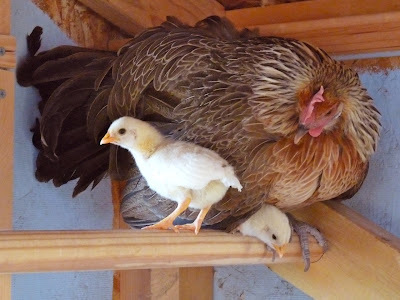 Ever since, both have claimed ALL three chicks, and I've gotta say from the looks of it, co-parenting rocks. Twice the vigilance, twice the defensive power against curious geese and chickens (these girls have SPURS), twice the teaching opportunities. Oh, and twice the effort I don't have to put into raising a new batch of peepers. 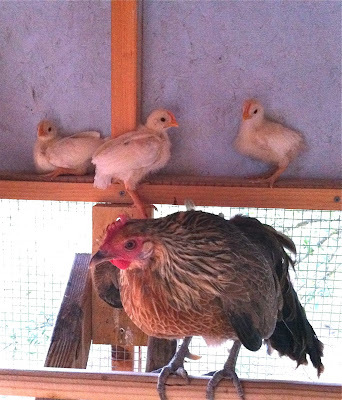 The new chicks are learning the ropes fast, and the moms introduced them to many chicken pleasures quickly, including the roost. Yeah, the human mama-hen about had a cow when she saw them all up there! The chicks maneuver quite well, actually. They climb up the ramp (which you can't see in the pic), then walk over the middle support beam that holds the perches, right on up to the top perch. If they want down in a hurry, they simply jump - their light weight and the deep sawdust litter below makes an easy landing. 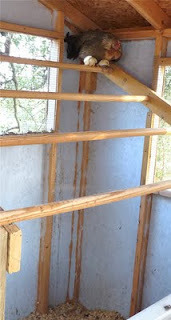 If they want to take their time, they'll jump from perch to perch. Their vertical leap is astounding. Is there a Chicken NBA? I first heard of Tree Collards on Growing Your Greens, an inspirational food gardening YouTube series. I saw the tall, graceful form and wondered, "hmm, could I grow these here?". The more easy-to-maintain perennial foodstuffs I can grow, the better! Photo: Tree Collard, credit to Perennial Tree Collards blog. Tree collards don't seem to bolt like other greens, rarely flowering and going to seed. The seeds also don't germinate "true", so any propagation will need to be through cuttings. 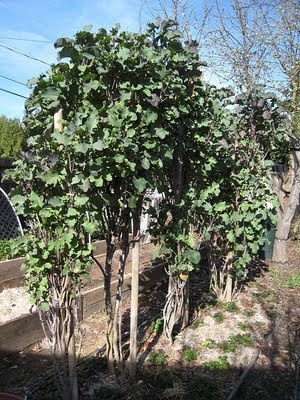 Found a bit more information on how to grow & maintain tree collards from Richards Farm. I've ordered some cuttings through Bountiful Gardens (along with some Kakai pumpkins that make hull-less seeds), and look forward to trying these out.